As air curtain burners minimize smoke or black carbon from wood waste combustion where black carbon is the second largest contributor to climate change after CO2, the machines have a near immediate positive impact on climate change. Air curtain burners, air curtain burn boxes, air curtain incinerators, destructors, trench burners, pit burners or by any other name, what are they? What are their applications and who uses them and why? It is surprising that a piece of equipment that has been around for decades and has a rather widespread realm of perfect applications is often unknown even to well-positioned operatives in general waste, agriculture or forest waste management. Photos courtesy of Air Burners. Historically, man-generated waste was either left in or on the ground or burned. Unregulated open burning of garbage still accounts for around 40 percent of all the trash worldwide. Many counties regulate open burning and in the U.S. that is the purview of the States and local governments and not the U.S. EPA. Most such regulations address the open burning of agricultural and forestry waste that is vegetative mostly woody debris. Combustion of any material releases gaseous emissions and particulate matter (PM). The widespread burning, especially of land clearing debris, became a smoke nuisance, mostly in the Southeast and Texas where large areas of growth were cleared for home developments and roadway construction. Air curtain burners were developed to overcome the smoke nuisance. They are a pollution control device to make open burning cleaner. The underlying principle of an air curtain burner is simple to envision, although optimizing the efficacy requires some sound engineering. An air curtain burner places a high velocity curtain of air over a defined burn chamber, which can be a temporary pit in the ground or a well-conceived above ground structure with refractory walls. In either case, the rising particulates or smoke particles (also referred to as “Black Carbon”) from burning the wood waste hit the curtain of air, are bounced back down and reburn in the area just below, which is usually the hottest area in the burn box and referred to as secondary burn chamber. They now are small or light enough to penetrate the air curtain and rise as gaseous emissions consisting mostly of water vapor and (biogenic) carbon dioxide. The result is not only a much cleaner, nearly smokeless burn, but also a much faster burn, as some of the air curtain’s volume is decisively directed in the burn chamber over-oxygenating the fire, thereby accelerating it. Early air curtain burners were of the in-ground variant called trench burners or pit burners, sometimes air curtain destructors. The need for a more controlled combustion process soon arose, because of the inherent volatility of the earthen trench causing inefficiency and undue smoke, especially in sandy, rocky grounds and where high water-tables are prevalent. This gave rise to the above ground air curtain burner, today mostly known as “FireBox”. This variant is a well-engineered combustion unit or “mechanized burner” balancing a very particular mass flow and velocity of the curtain of air to yield a well optimized perfect burn. High-tech fans produce the airflow powered by either small diesel engines or electric motors where machines are in stationary placement. FireBoxes can be offered in various sizes, are of a rugged skid-mounted construction, usually have no bottom and are fitted with refractory walls from a proprietary thermal-ceramic mix assuring a very long useful life of the systems. As batch loading is required, typically excavators, front loaders, Skidsteers or similar such machines are employed. A single loader operator also minds the FireBox, but he can load up to three machines placed next to one another. Variants include roll-off FireBoxes that can be moved by standard roll-off trucks, smaller trailer-mounted units and systems with steel floors for use on barges, asphalt surfaces, sensitive forest floors or the like. After decades of use, trench burners have not lost their popularity; the small land clearing operators, especially in the Southeast rely on them, often renting them from heavy equipment dealers for their smaller jobsites. Today, one will find FireBoxes worldwide in forestry, at landfills and transfer station, in agriculture at growers and processing facilities, industrial sites and at disaster recovery operations with governments and private industries, to mention a few. In many applications, air curtain burners not only close down open burning operations, but more importantly, they extend the lives of many landfills by eliminating the need to dump vegetative debris into them, including chips and mulch. As FireBoxes accept woody debris as it is collected, they also eliminate the need for chipping and grinding in many situations. This has a positive impact on the environment, as chippers run large diesel engines consuming sizable amounts of hydrocarbon fuels, thereby causing significant pollution along with releasing carcinogenic wood dust. Related thereto is also the reduction in the need to operate trucks to transport the chips or mulch, as grinding is not a finite disposal solution compared to FireBox combustion; grinding only simplifies the transport of the woody debris whereas air curtain burning eliminates it leaving only a small amount of useful wood ash, some of which is biochar. As any other source of emissions, the EPA has devised rules and regulation for air curtain burners, as have most States. When first confronted with understanding and regulating the air curtain burners, the EPA lumped them into the incinerator category, because of the lack of any other suitable classification. This has caused many misunderstandings and over-regulations and regulations that are confusing, do not really apply or miss the real live practical usefulness of the machines. An incinerator by definition requires an external fuel source, such as natural gas or coal that by using flames and heat incinerates the waste materials, burns it to ashes. The air curtain burner in contrast uses no such external fuel source. As its waste consists solely of clean untreated wood waste pursuant to EPA regulations, the BTUs for its combustion stem from the waste itself: the “waste is the fuel”, just like an open burn—only cleaner and faster. A word about emissions. 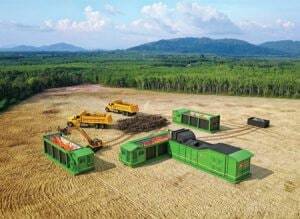 Burning the unwanted biomass releases a considerable amount of CO2—is that not a bad thing? CO2 is an undesirable greenhouse gas, no doubt about it. Contrary to the CO2 emitted from sources that require hydrocarbon fuel, such as grinders, trucks or airplanes, air curtain burners only release biogenic CO2, which is the same amount of CO2 that the wood while alive as a tree took in from the surrounding air releasing oxygen through photosynthesis. This CO2 is called biogenic CO2. The CO2 from burning hydrocarbons would never turn into a greenhouse gas, if it were left deep down in the Earth where it has been confined for millions of years. The environmentally friendliness of air curtain burners has further been augmented by systems that harness heat from the combustion process and convert the energy into electricity and thermal heat for a verity of practical uses. 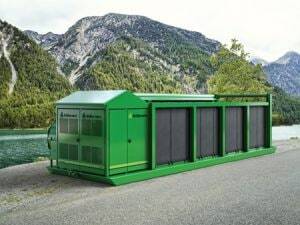 These machines can power entire recycling yards or provide power in remote areas or at disaster sites where wood waste is usually in abundant supply and a menace that must be addressed. They eliminate massive amounts of such waste while powering itself and supplying excess power for other uses. The heat could assist in purifying potable water in areas where good drinking water is scarce. Recent hurricanes, storms, floods and catastrophic wildfires bring climate change issues to the forefront and what manmade pollutants could be minimized to achieve a noticeable positive impact to reverse it. As air curtain burners minimize smoke or black carbon from wood waste combustion where black carbon is the second largest contributor to climate change after CO2, the machines have a near immediate positive impact on climate change. Black carbon as an aerosol falls back to earth in a short time period of weeks and is the major contributor to the melting of the polar ice cap, for example, which results in rising ocean sea levels. In contrast, the lifetime of CO2 in the atmosphere is measured in hundreds of years and any reduction in CO2 emissions will only be beneficial to future generations. However, banning open burning, including controlled broadcast burns for forest fuels management and agricultural waste burning in favor of employing air curtain burners, will have an immediate effect on reversing global warming and should be implemented and enforced with vigor. Norbert Fuhrmann is Vice President of Air Burners, Inc. (Palm City, FL). He has been with Air Burners, Inc. for 20 years and has worked in the field of high-tech manufacturing and sales for most of his business career. For more information, e-mail info@airburners.com. Recycling: When is Waste Not Waste?